The Investec Ashes series heads to the Oval for the 5th and final test this week with England looking to make history by securing a 4-0 home victory over Australia for the first time. All-rounder Chris Woakes and spinner Simon Kerrigan have been drafted into the three-lion’s squad to replace injured pace men Graham Onions and Tim Bresnan; the latter ruled out for the rest of the cricket summer with a stress fracture of the lower back. Australia meanwhile enter the final test once again in disarray after a humiliating 74-run defeat in the 4th test at Durham and the tourists will be desperate to restore some pride ahead of the return series which starts in Perth this November. Struggling skipper Michael Clarke will be hoping that his fragile batting unit can finally string together some runs, having only once passed 300 with the bat in 8 innings so far in England. Usman Khawaja, Phil Hughes and Steve Smith were all warned by coach Darren Lehman last week that their “careers are on the line” following their failures so far in the series and those 3 will be battling to put that right when the action commences on Wednesday. The tourists also have concerns over their bowling attack with the injury-prone Ryan Harris likely to be wrapped in cotton wool following his heroic exertions with the ball at Chester-Le-Street and selection dilemmas concerning Jackson Bird and Mitchell Starc. 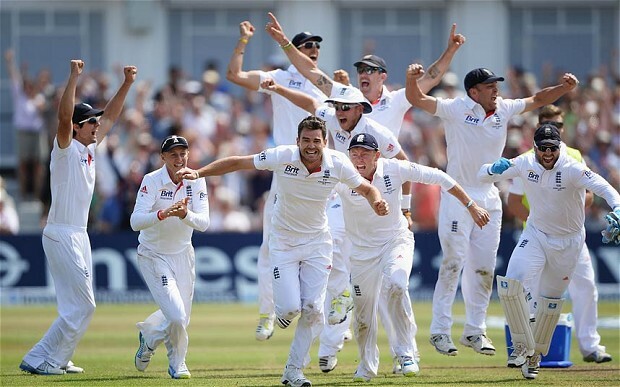 England will be in buoyant mood ahead of their trip to the Oval, a ground where they have won 16 from 35 Ashes tests, and the hosts are set to recall quick-man Chris Tremlett who last featured against the Australians when he took England’s final wicket to cement a 3-1 series triumph down-under in 2010/11. Spectators will hoping that any rain stays away for the 5 days but some forecasters are predicting partial disruption to play which is why bookmakers like Williamhill are pricing the draw at 5/2. Regardless of the result, at the end of this test match England will once again be presented with the famous urn. Australia’s mission is to lay down the foundations for a different outcome later this year.